Our Ambalam are noble edifices built out of compassion for foot weary travelers. Later they underwent certain modifications and one would even find in them seeds of wayside inns that the west claim as their invention. The Pitakotte Ambalama though now in a sorry state has its own spectacular history as royal visitors and Ministers rested there waiting for summons from the palace. As children's orbit of awareness widens they tend to ask some strange questions. "How is it that at one corner of Colombo there is a Kotuwa and a Pitakotuwa and at the other end again a Kotte and a Pita Kotte?". That was what my grandchild wanted to know. At least on one point he seemed to be clear, that is that Kotte and Kotuwa have more or less the same meaning. I remember the late Mr Ananda Tissa De Alwis getting into hot water after stating at a public meeting that Kotte is a Tamil word. Scholars buzzed over this and many opined that it is a Sinhala word. I have no intention of getting entangled in that issue. However I had to answer my grandson. And did it as simply as I could or may be the simplicity was a cover for a complicated set up. "It is simple. About 500 years back when the Sinhala people threatened from the North were looking for a secure place to put up their capital a Minister named Alagakkonara located a place by the Diyawanna where it branched off and built a Kotuwa or Kotte or Fort there and the king's Palace was built there. In due time an outer Fort or Kotte grew around it and that was called Pita Kotte. You know that the Westerners or the Suddhas came over here from across the seas and they put up a Fort close to the Colombo Harbour which expanded later. That was called Kotuwa and as years passed the area around it came to be known as Pita Kotuwa." Of course I had made it too simple, even inaccurate for there are in the first instance not two but three Kottes today ie. Kotte, Pitakotte and Etulkotte. Kotte proper today is known as Sri Jayawardenapura Kotte and is made famous by the siting of the Parliament, but locals contest that too. They say that the Parliament is actually sited not in Kotte but in what was once a forsaken island in the large village of Madiwela or Mahadiya Wela (Torrent of water) that brought down waters from an outer hilly area to palins below. In the particular island called Duwa, today the location of our grand Parliament had been a grove of coconut trees that attracted men seeking bliss from a beverage fermented in sheathes of the coconut flower. They sailed in boats cruising along Diyawanna waters to climb the trees to manufacture the Sura that made men dizzy and act strange. That is how times and climes change. Our topic however is the Pitakotte Ambalama, today a sorry sight but 500 years back the Southern entry point to the Great Kingdom of Kotte. The book "Ambalama, buildings of Sri Lanka" put out by the Faculty of Architecture, Moratuwa has this into on this Ambalama. It refers to Kotte Ambalama also called Galambalama different from Matiambalama or clay Ambalama now totally extinct and unknown except by bus conductors who howl the name. Galambalama's earliest written evidence is found in a map of the Kotte Kingdom (1413-1565) indicating the present site. It had been placed at the junction of three main roads, ie. The roads from the four gravats or Kadavath, three gravats and Kalutara. So the time gap of 500 years simply fades away for even today it serves as a junction of three main roads ie. Colombo - Nugegoda road (going on to coastal town), Battaramulla Dehiwala road (again going on to t he coast) and Borella Thalawathugoda road also named the New Hospital Road. 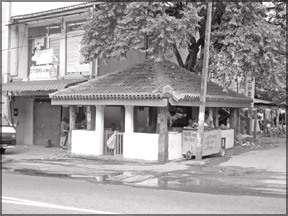 This Ambalama had been built here as a location for people to rest before entering Etul Kotte from Pitakotte. Unauthorized people had to wait at the Ambalama till permission was given to enter for the royal Palace was within. How time seems to stand still! Even noblemen had to wait in this place till signals for entry were given. It was a time pregnant with threats of invasion from the North. Hence the precautions probably. Looking at the Ambalama today one can wonder how it put up a crowd and the above book has this explanation. "The length of this Ambalama is unusually long"! The section protruding on to the tarred road has been destroyed. One gazes at the pathetic looking ambalama and wonders on this. Not more than ten people can move about there while stray dogs and cats find it a paradise. What has happened to the old Ambalama? Doesn't it need a resurrection? Elongation is impossible. Ambalamas are themselves a significant component of the Lankan architectural tradition. They can be even described as noble edifices since compassion for way - weary travelers has usually been the motivating factor in building them. Rich philanthropists have been the main builders of them, kings rarely intervening. They are the earliest community centres too. Later men gathered in them to discuss important public issues. Travellers on long journeys sat there, sometimes overnight and exchanged information. Even the State later used them for judicial matters and such like. These Ambalamas dot the island in many places. Some are of high architectural vintage flaunting decorated Pekadas etc. They exude a comfort since they are built in open airy spaces, usually where roads intersect or at famous entrances like the one near Aluthnuwara Devale. Absence of high walls and convenient and low seating arrangements beckon the traveler. Some Ambalamas seem to have had sections for dressing and cooking. (Genesis of wayside inns and a local hotel concept?) Preserving these are almost a bounden duty primarily because they are an epitome of our folk architecture. The day after I read the above book I passed the Pitakotte Ambalama as I live in the vicinity. A dog reigning there barked at me and a cat protested with a noisy purr. They seem to own the place sharing it with cheap posters advertising a hundred odd things in the chaos of which sat a half naked man smoking and grinning to glory.... Perhaps he sat just where an Amathi (Minister) from the South reclined after having travelled weary miles perhaps on horseback with a Sandhesha to the Chakravarthi reigning at Kotte. All that splendour has now been relegated to the past. A welcome sight would be this Ambalama resurrected to its original form. Just about 2 kms away from the Parliament and in very close proximity to the ancient Palace now marked only by a cemetery along Maligawa road, this Ambalama certainly deserves a better deal. As for the Palace shedding a sheen of blue crystal, let us forget the whole tragic episode as it lies buried under a maze of modern houses.... "Buried city of Kotte" they say but an edifice not yet buried is the Pita Kotte Ambalama, just now turned into an eye sore.